But will get extra content. 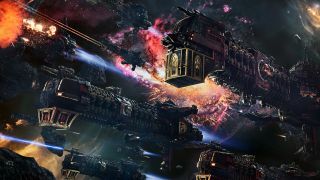 Battlefleet Gothic: Armada 2 has been delayed into next year, publisher Focus Home Interactive has announced. Originally scheduled for release in September, developer Tindalos Interactive has now pushed the game—which pits Cathedral-sized spaceships against one another in gigantic RTS battles—into January 2019. “These couple of additional months of development will allow developers Tindalos to polish the game and bring all their ambitions to life after the great success met by the first game,” Focus Home said in a statement. These months won’t be used purely for fine-tuning, however. Focus Home added that the extra time will also see a new feature added to the game; cooperative multiplayer. This will be functional across the three new narrative campaigns the sequel offers. What’s more, Players who pre-order will be able to get involved in this coop action early, through two closed betas. “More details about the dates and content of these pre-order betas will be communicated shortly,” Focus Home said. Battlefleet Gothic: Armada II aims to expand upon the success of the first game, making all 12 of the original tabletop game’s factions available to play at launch. Alongside news of the delay, Focus Home released a new faction trailer showing the different fleets in action. It also includes a scene in which a spaceship literally devours another spaceship, which certainly piqued my interest. You can watch that below.